How is it possible to obtain a common standard for energy efficient building, which aims high for new buildings, while also being utilised for existing buildings? The best starting point for this discussion is the EU-Building Directive and the connected “Nearly Zero Energy Building” standard. For new building projects, it is possible in many cases to establish a 100% zero energy building standard, even though it is demanding in respect of optimising the architecture with the help of new types of energy producing facades and roofing materials. If the aim is 100% zero energy building, then it is easier to obtain for larger buildings with only a few storeys, because the amount of building surfaces are higher, e.g. to be used for solar electricity production. And more optimised concepts can be obtained, when you are not only dealing with one building, but instead are aiming at optimising renewable energy production for whole city areas where the best surfaces can be utilised including local infrastructure. At the same time 100% zero energy building is easier to obtain for housing than it is for public or commercial building since the household electricity use is not included in the energy calculation of a building. From an economic point of view it can be preferable to handle the whole electricity consumption for a complete housing estate with several buildings as one consumer based on one electricity purchase meter if e.g. the involved housing association can handle the individual electricity billing based on sub meters for individual apartments. In this case, also household electricity use is included. For renovation projects, similar solutions in many cases will also be possible; such as if you are dealing with deep renovation, where the renovation also includes exchange of roofs and facades. For more distributed low rise housing areas, this model will need an improved way of handling the actual electricity production and consumption metering by a kind of virtual metering concept to ensure more reasonable extra metering costs. A solution which Danish authorities in principle has agreed as useful to implement in practice. If the mentioned policies are implemented in practice, it will be an obvious choice to combine these with use of the international “Active House” standard. This has a combined focus on “energy, comfort and sustainability”, based on 3 criteria for each of these areas, and with possible use for both new building as well as renovation. 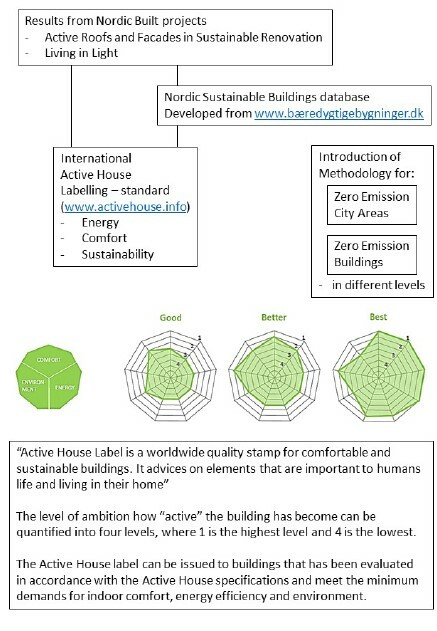 Before a building can get the official Active House label, the Active House standard demands, that all parameters are evaluated and verified. See also www.activehouse.info and www.aktivhusdanmark.dk, where the benefits of working with a global oriented standard is illustrated, especially with a very strong focus on indoor air climate, something which is not handled in a clear way in the EU building directive. It can be suggested to utilise and adapt the Active House Standard; it also includes a focus on user satisfaction and performance documentation in practice, at the same time as different levels of zero emission standards by help of renewable energy is included. Here it is suggested to use f.ex. prosumer level 1,2,3, and 4, to show how much your building lives up to a zero energy building standard alongside the general energy quality of the building.